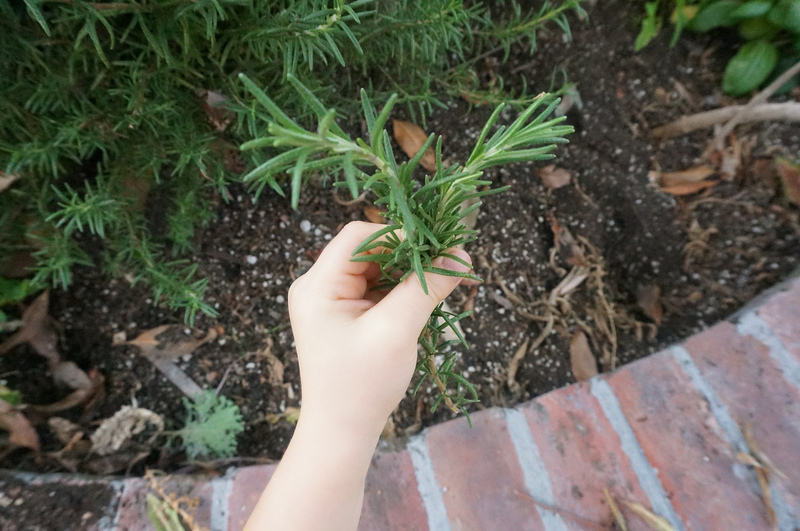 This is the first in an upcoming series of posts on how you can feed your family from your local farmer’s markets in the Los Angeles area. I am of the belief that there is no point in eating meat if you’re not eating meat from an animal that was raised to graze on the food it’s meant to eat, tended with love, and killed in a humane way once it was of the proper age. Cows are not supposed to eat grain, chickens are not supposed to eat corn, livestock should not be raised in over-crowded, unsanitary feed-lots, and fish are best when caught sustainably in the wild. Last Fall, my husband and I bought a quarter grass-fed steer from a friend’s ranch in Northern California for $5/pound – possibly the greatest joint decision we have ever made, other than deciding to have kids – but that’s ALSO another story for another day. If you’re not ready to invest in buying organic grass-fed meat in bulk (and a stand-alone freezer to keep it in), which is a big undertaking, it’s quite easy to buy meat from ranches that sell directly to the public. Each week, I visit between 2-3 different farmer’s markets in order to buy locally grown fruit, vegetables, meat, fish, chicken, pork, eggs, milk, cheese, dried beans, and the occasional snack such as musubi (seaweed-wrapped rice balls). I will be reviewing the markets I visit the most, in an effort to share with you my favorite tips, over the next few weeks. 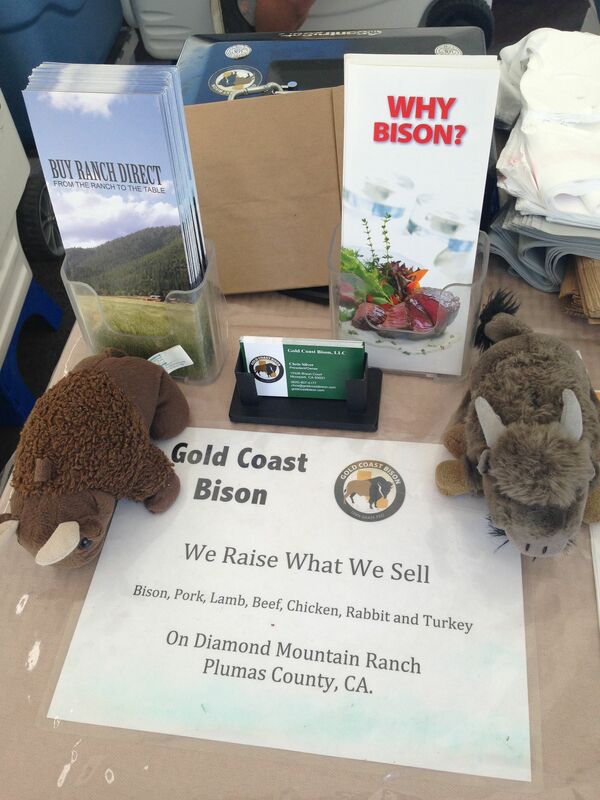 I’ve been buying bison from these folks for over 5 years. 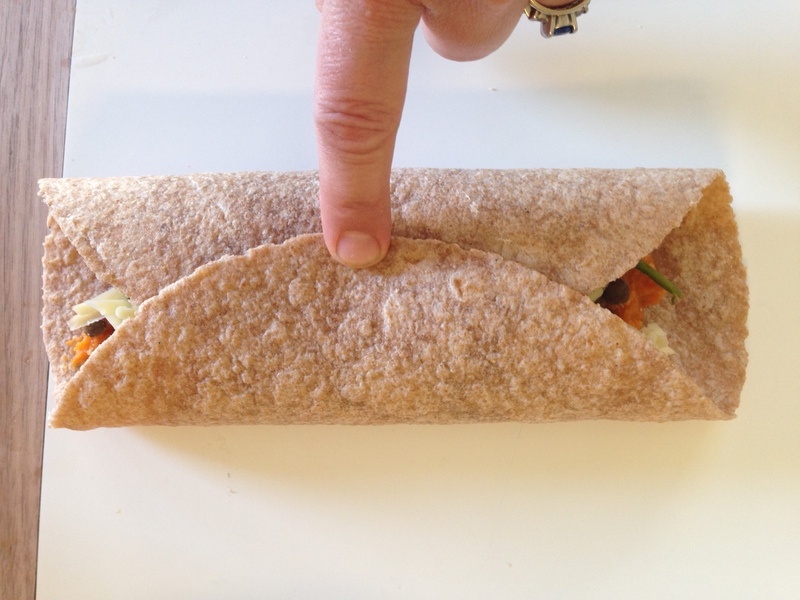 If you haven’t tried bison, it’s time! It has twice the iron of beef, and in Chinese Medical terms it is profoundly blood-nourishing: an excellent choice for post-menstruating women, kids on a growth spurt and anyone who does a lot of physical activity. Bison bones make my favorite bone broth! Today we picked up our pre-order of ground bison (for grilling burgers on Labor Day weekend!) and heritage bacon (for brunch and snacks); one of the awesome things about Diamond Mountain Ranch is their weekly newsletter, which allows you to place an online order of whatever you need; they have such a following, they almost always sell out of everything they bring in their umpteen coolers. All meats are vacuum-sealed and frozen, so you can buy as much as you need (or have space to freeze) if this market is not a convenient one for you. We learned today that technically, you can only use the word “cow” if the lady has given birth to a calf. Otherwise she’s a heifer. See the things I learn from my 5-year-old’s incessant questions? 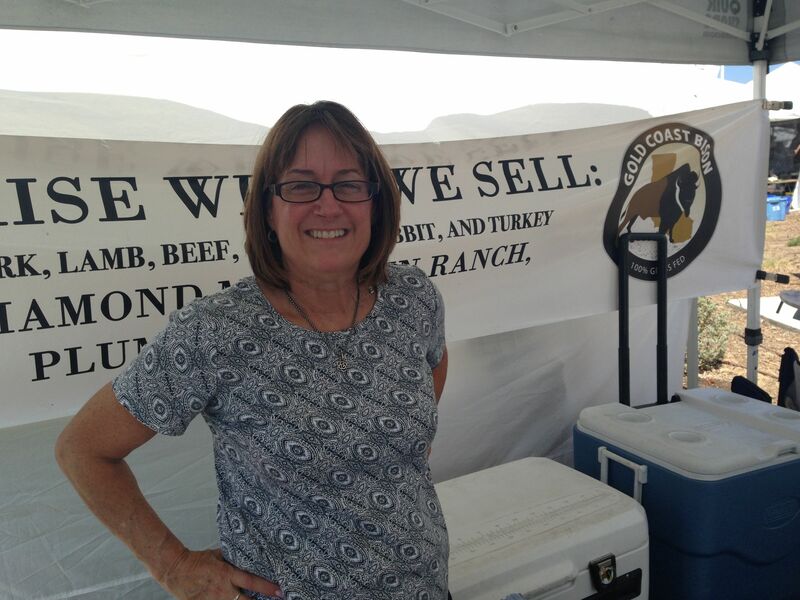 Here are the farmer’s market locations in SoCal where you can find Diamond Mountain Ranch; note that the La Canada Farmer’s Market is missing from their list of Saturday locations, but they are there every week. If you have questions or want to pre-order for pick-up or place an online order from them, click here. 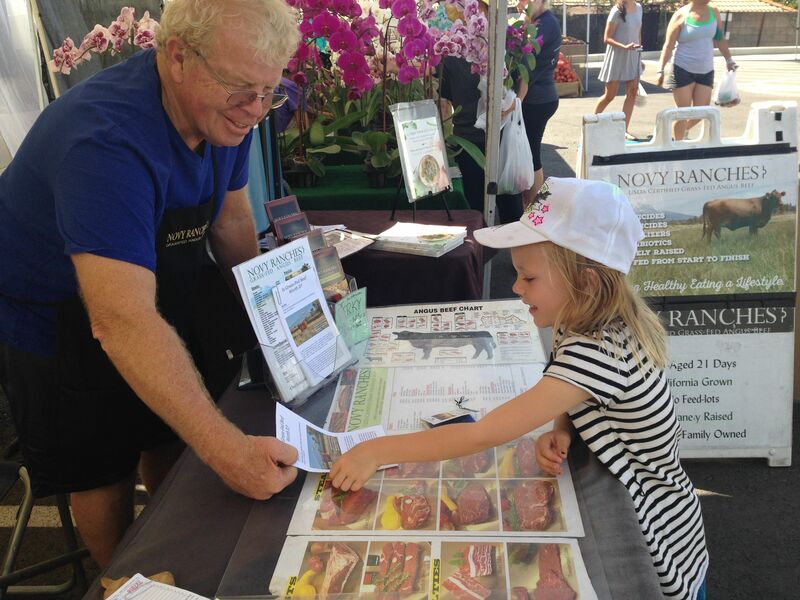 We also love Novy Ranches (based in Simi Valley), which specializes in Certified Grass-Fed Angus Beef, and also offers online ordering. In fact, Little One has been known to chat with Jerry for 15 minutes straight, sharing her favorite ways to drink bone broth. (“I like it with rice and broccoli, but I don’t like the smell when my Mama’s making it.”) I buy from Novy Ranch at the Altadena Wednesday market and/or the La Canada Saturday market, but they sell at 14 markets in SoCal. Novy has the best beef knuckle bones around, along with some terrific recipes. 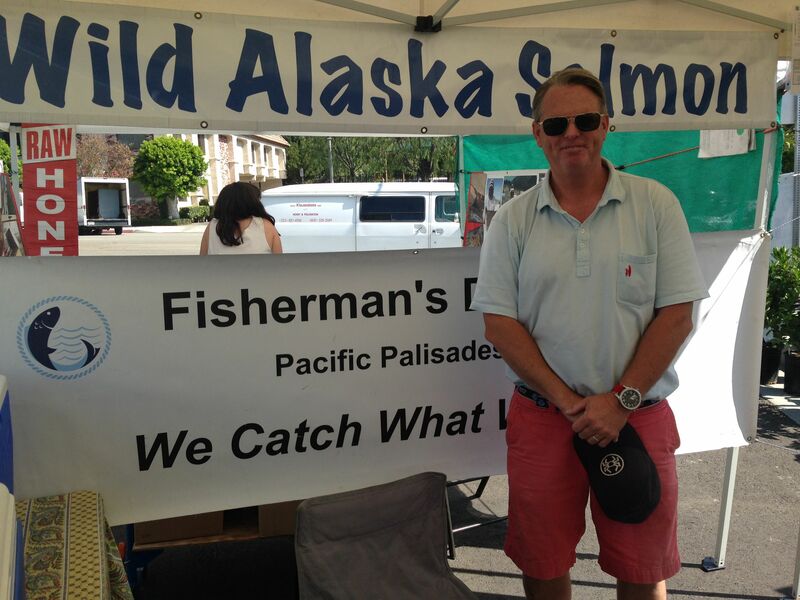 The real treat today was meeting Pat Ashby, owner of Fisherman’s Daughter. Once a year, Pat spends two months in Alaska, catching 150,000 pounds of wild Alaskan sock-eye salmon at their peak. According to Pat, he sells 140,000 pounds of these salmon to the Japanese, and brings 10,000 pounds back to LA to sell at the local farmer’s markets. 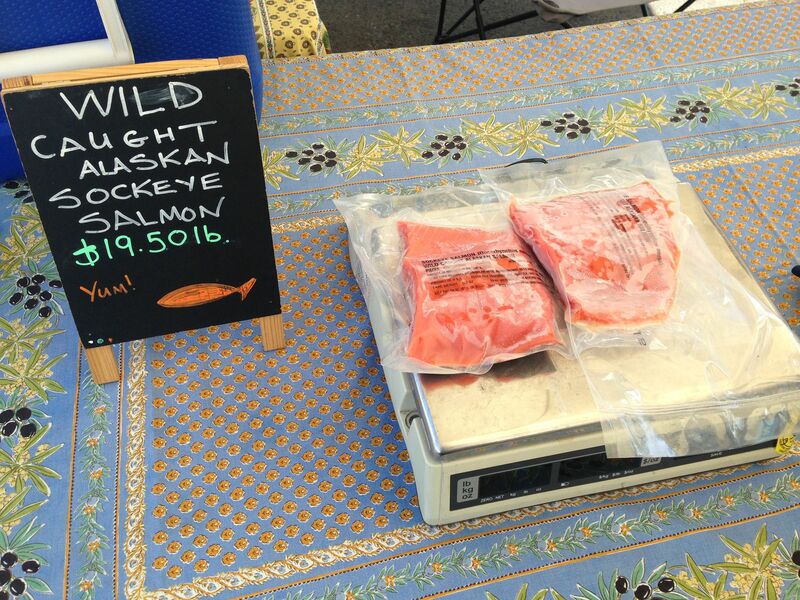 Because wild Alaskan salmon have a season that is just about 4 weeks long per year, they have to be frozen anyway, and this allows Pat to sell them year-round. His salmon has been pin-boned and flash-frozen, and is offered in 1/3 pound, 1 lb and 2lb (whole fish) packages. Wild-caught Alaskan salmon is incredibly high in Omega-3’s, as well as the fat-soluble vitamins D, E, A and vitamins B and B6: it is considered by many cultures to be the perfect food for pregnant and lactating women and a terrific starter food for babies. Sockeye salmon is also very low in mercury and other environmental contaminants, as they are less carnivorous than most fish: they mostly eat krill. Many studies have been done on the cardiovascular benefits of wild salmon, including its ability to lower LDL (“bad”) and raise HDL (“good”) cholesterols. From a Chinese Medical perspective, salmon is one of the few fish that is “neutral” – i.e. it is right in the middle between a cooling food (which helps “heat” conditions) and a warming food (which helps “cold” conditions). Sadly, I have an anaphylactic allergy to all fish, including salmon. My allergy is so bad I have to carry an Epi-pen and am trained in injecting myself if I should become exposed to fish or seafood. I can’t even wash the dishes if they have fish on them. Thankfully, my husband and kids do not suffer from this allergy, so we make sure they get to eat good-quality fish cooked at home once a week (this gives me an excuse to go to a dance class or meet a friend for tea during evening routine, Ah-hem). 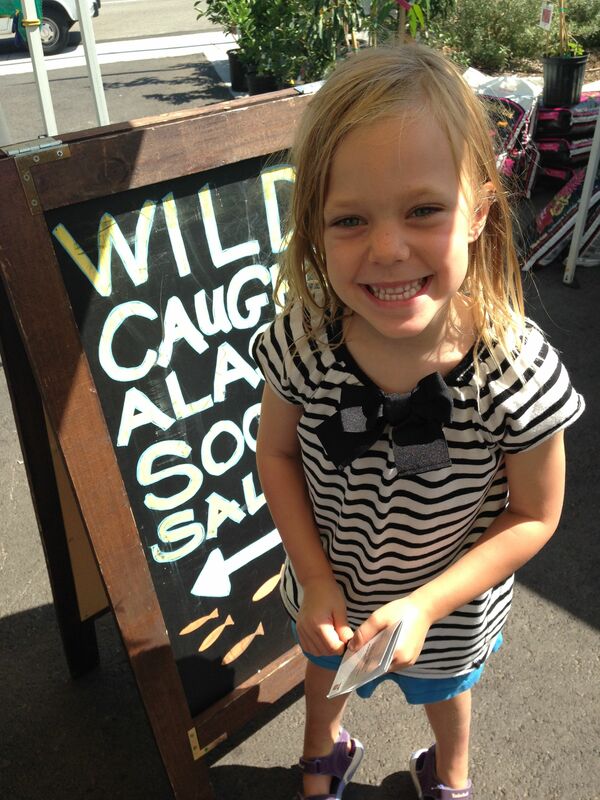 Little One and I bought about 1.5 pounds of wild Alaskan sockeye salmon from Pat. He said if we’re planning to cook it within a week, to just put the frozen packages in the fridge; otherwise, they can stay frozen for later use. Our meal plan for this week includes Wild Alaskan Sockeye Salmon (which hubby will cook on the grill in foil) with quinoa and veggies. Pat said to cook the salmon filets on a gas grill (350 degrees) for 10 minutes on medium-high, skin-side down; after 10 minutes, turn off the grill, let the fish sit in tented foil for another 10 minutes, then serve. 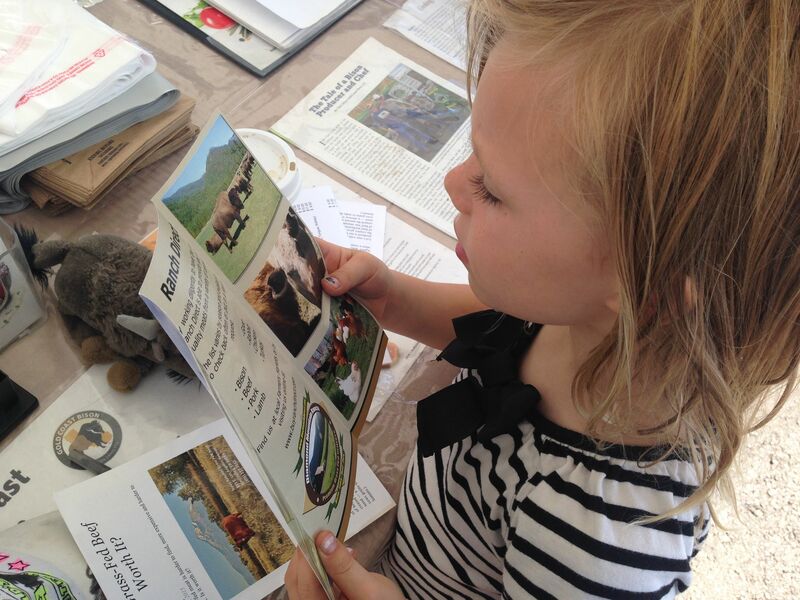 Raising kids in a major city means we have to make an effort to educate them about where their food comes from. 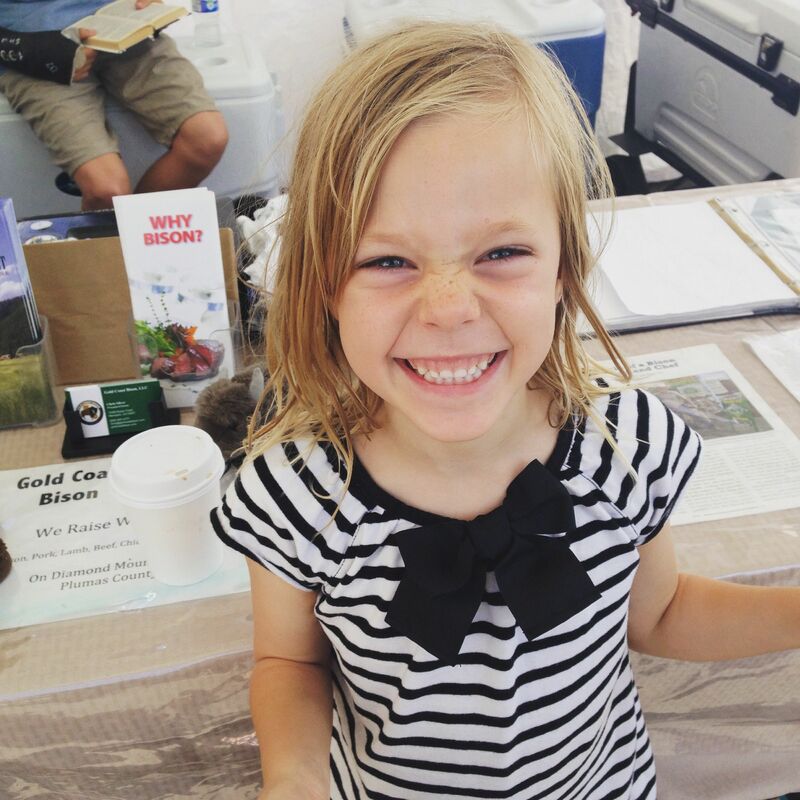 When kids know where their food comes from, they are much more likely to eat it. They develop healthy eating habits, waste less, and become connected to the Earth in a new way. 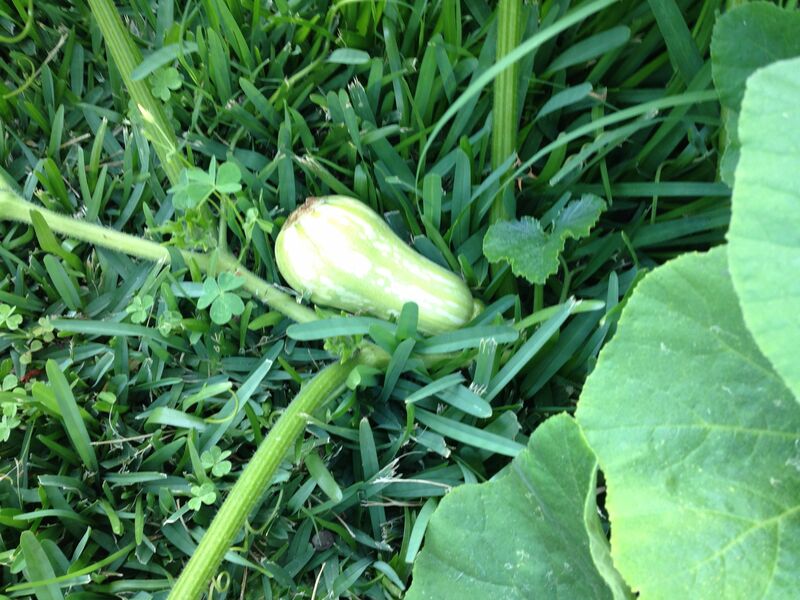 I feel endlessly grateful, as a woman who grew up in the inner city of New York in the 1970’s and 80’s, to have a back yard with an organic garden with vegetables and fruit trees, and to be able to find broccoli grown within 60 miles of LA in January. In spite of my dreams of becoming a Los Angeles version of SouleMama, I still kill tomatoes and cry about it. I will likely never be raising goats, heifers, pigs or sheep on my 7500 square foot lot. (Maybe chickens. Maybe.) 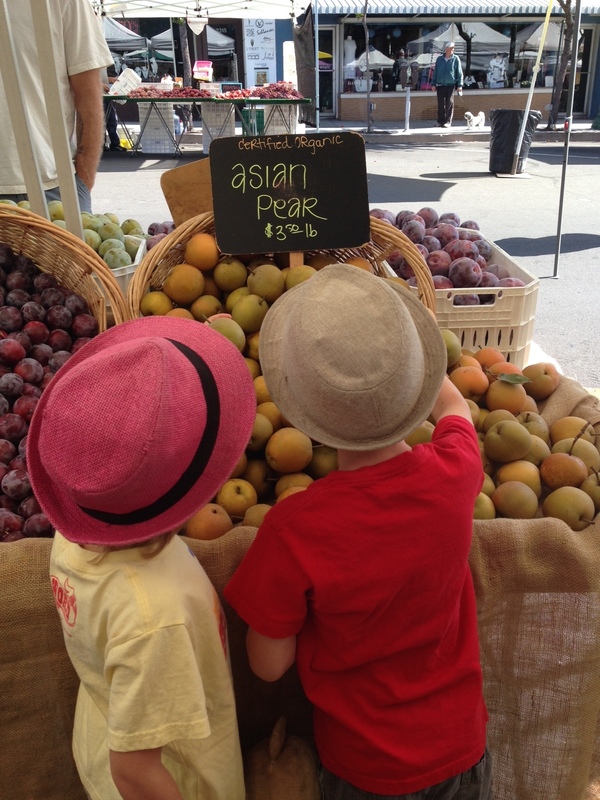 The farmer’s markets of Southern California give me community, and lift the veil of smog just a little bit, inspiring me to plan my family’s meals around what is fresh, in season and affordable. All photographs copyright Abigail Morgan, L.Ac. On Friday, I taught you how to make Turkey Bone Broth using your leftover turkey carcass from Thanksgiving. 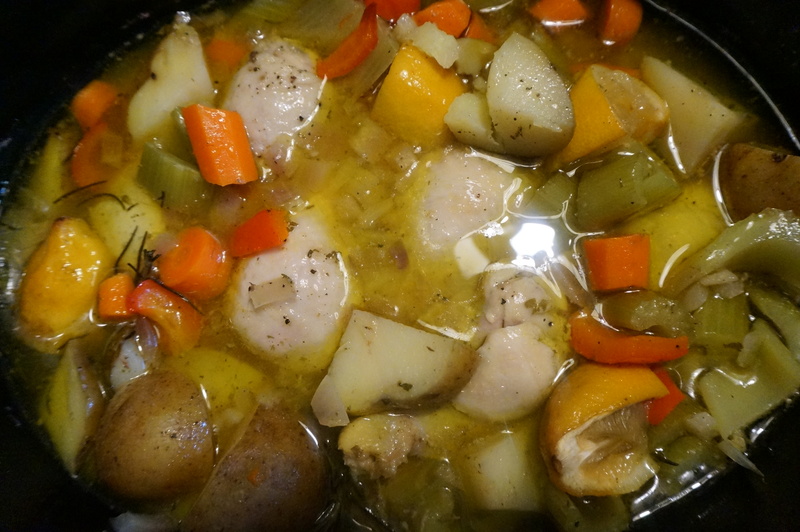 Now you get to use that delicious bone broth (or chicken broth, if you prefer) to make Turkey, Bean & Vegetable Soup, a nutritious and comforting one-pot meal that makes use of the random extra vegetables, potatoes, herbs, beans and meat you may have in your fridge. This soup is nourishing to the Spleen and Stomach organ systems, easy on digestion, and a great immune booster, so it’s an excellent choice for this late Fall/early Winter time of year. 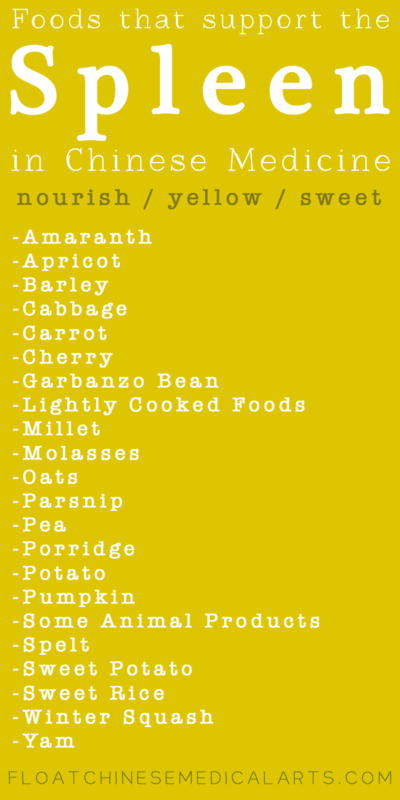 It’s also a great fertility food: a nice way to get in your daily dose of bone broth when you’re trying to conceive. The idea of this soup is that it’s EASY. Although Turkey or Chicken Bone Broth takes about 24-36 hours to make, most of that time is passive: it leaves you with lots of broth to freeze for later use. If you don’t have bone broth, and just need a quick soup for tonight’s dinner, this recipe fits the bill. You can use store-bought broth in place of bone broth, it just won’t be quite as nourishing. Feel free to use your creativity and substitute whatever vegetables and herbs you have on hand, and toss in leftover cooked chicken, turkey, sausage, and/or beans. 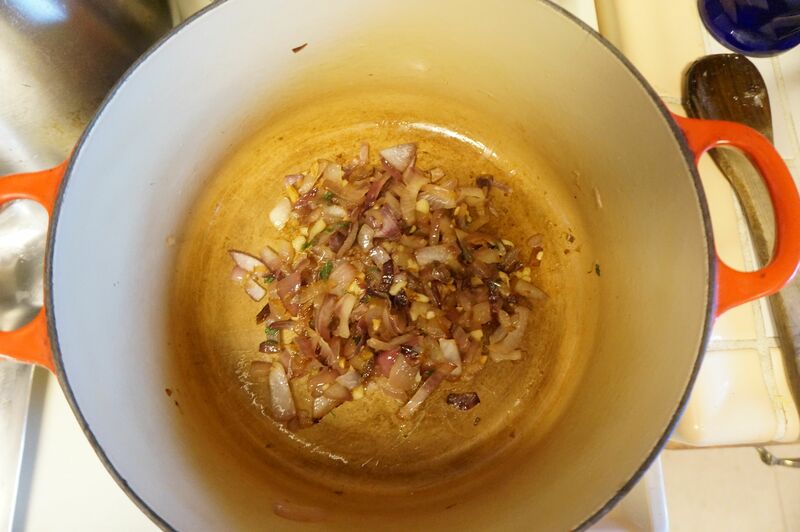 *My homemade beans recipe: 1 c. dried organic beans (black, pinto, kidney, etc., or combination of the above), washed, soaked 6 hours or overnight in a bowl, then cooked 5.5 hours on HIGH with 8 c. of water, 1 bay leaf and 1 pinch cumin powder in a slow-cooker. You can use canned beans if you don’t have homemade ones on hand or are short on time. 1 c. cooked turkey (boneless), or 1 c. cooked chicken or sausage – use what you have! You can also omit this step. 2.) 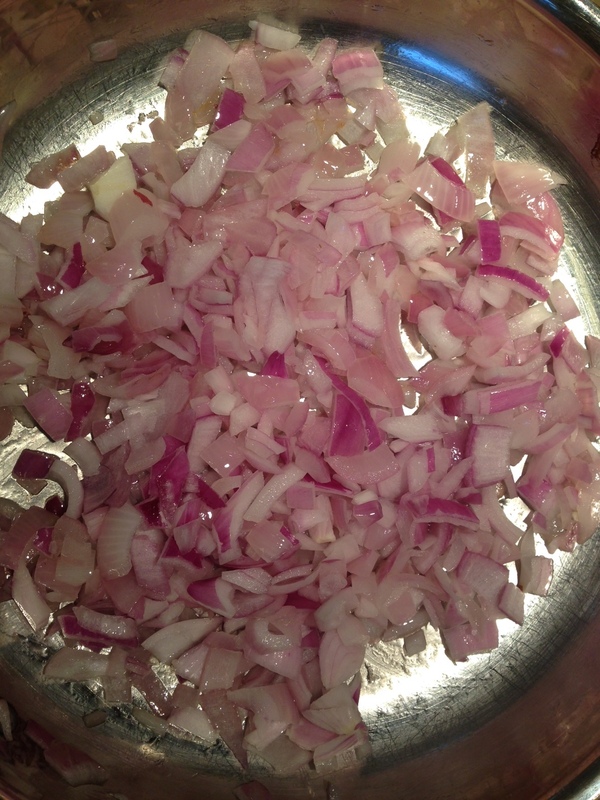 Saute onion, garlic, chopped sage and a pinch of salt on medium, until transparent and fragrant. 3.) Add bone broth, water, vegetables and potatoes. Turn to high and bring to a boil. Once boiling, reduce heat to medium low, stir, add bay leaf and simmer 30 minutes, stirring once or twice. 4.) 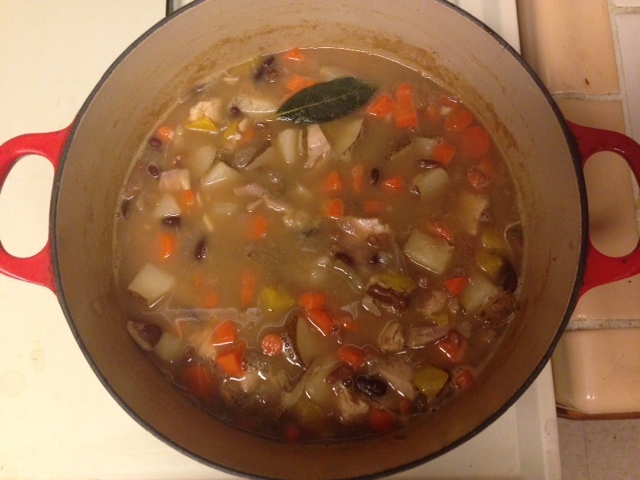 Stir in cooked beans and the cooked turkey (or chicken or sausage) and simmer another 10 minutes. 5.) Add salt to taste. 6.) Reduce from heat and let sit 10 minutes or so. 7.) 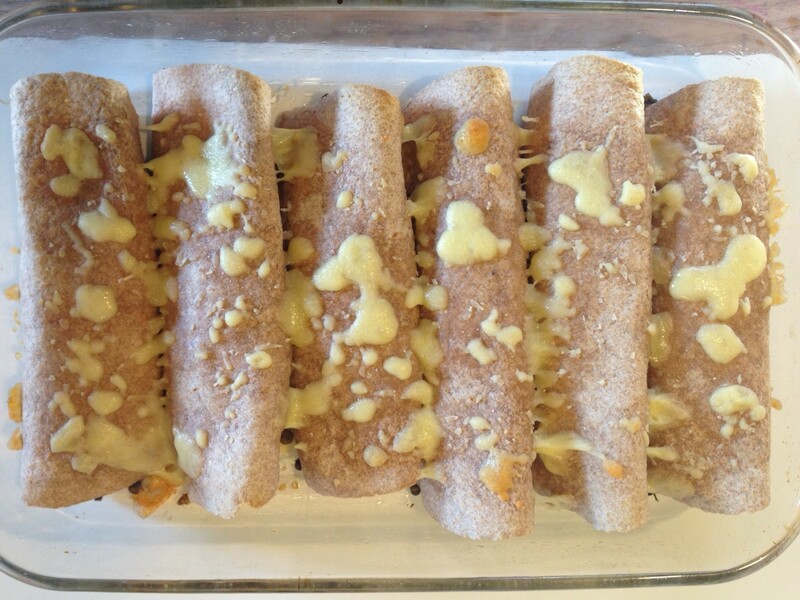 Serve with a sprinkle of parmesan cheese on top of each bowl, and maybe some crusty sourdough bread on the side. 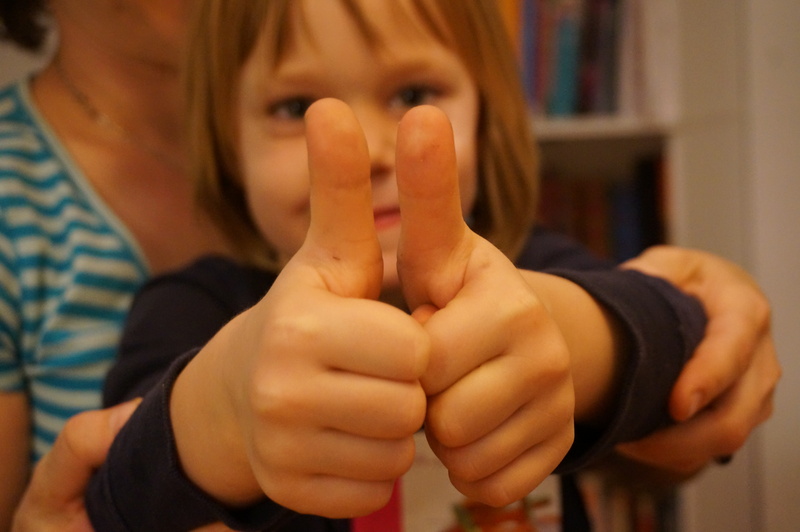 My daughter (above, sitting in my lap – her favorite place to eat dinner) gave the soup two thumbs up. 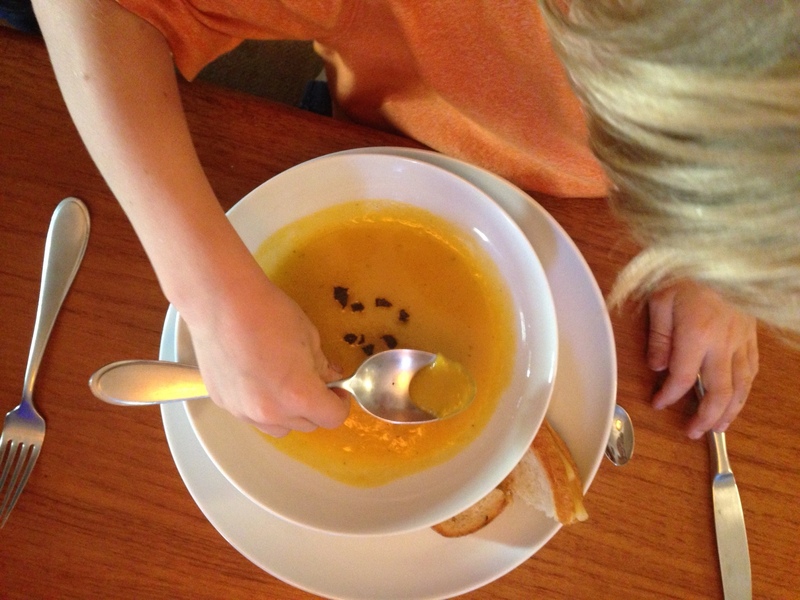 What’s your favorite kind of soup for late Fall? Written by Abigail Morgan, L.Ac. ; photos by Abigail Morgan and Dave Clark, all rights reserved. 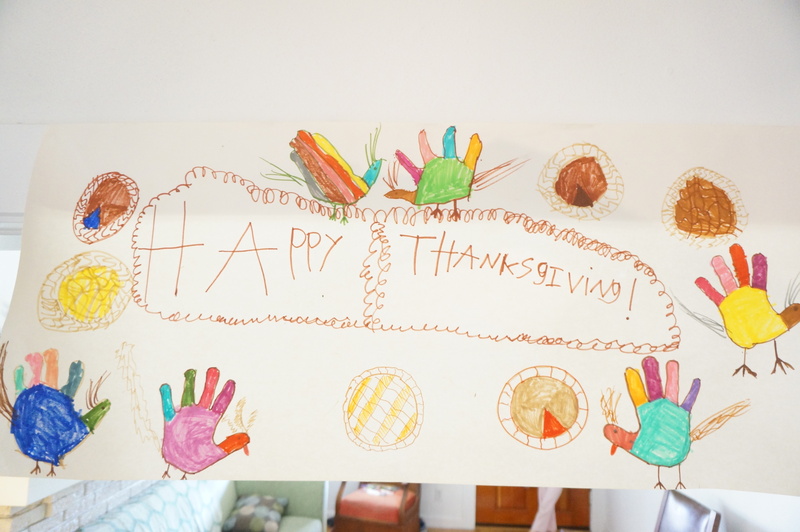 …banner courtesy of my kids. It was just the 4 of us: me, Dave, our son (6) and daughter (4). We shopped early, used Good Eggs to deliver our turkey and a bunch of organic produce on Tuesday night, and cooked only our favorite dishes. We kept the day really simple. Dinner at 5:30, because that’s when we usually have it, and because we couldn’t bear the idea of rushing to serve the entire meal by 3:00 while also running interference between little kids, who would then be hungry again right at bedtime. It worked. And we have lots of leftovers. The day after Thanksgiving, I’m all about leftovers. A nice soup is my answer to what to do with the turkey carcass, extra raw vegetables and herbs you may have on hand after Thanksgiving. 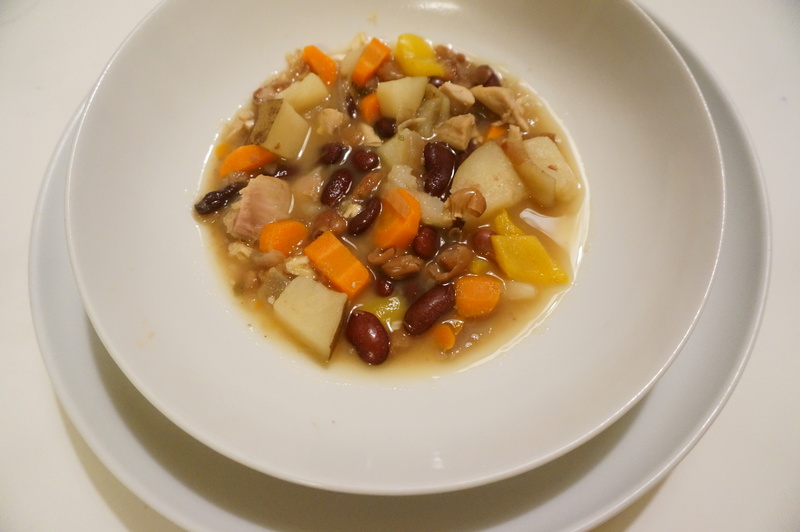 Basically, you 1) make turkey bone broth in a slow-cooker while doing other stuff, 2) add leftover turkey meat, beans and vegetables, and you have a crowd-pleasing, nutritious meal in a bowl. Easy. You might balk at how long it takes to make turkey bone broth. The active time is minimal, and if you have a slow-cooker, you can allow it to do your cooking while you sleep and/or are at work or chasing after your kids. You will have SO MUCH BROTH, you’d better have some jars on hand to freeze the extra! 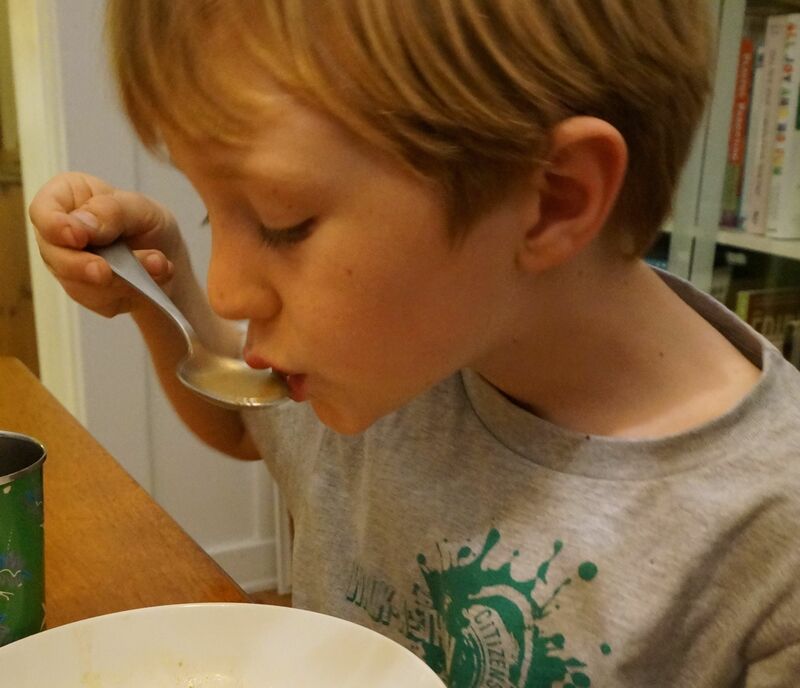 As a working mom who prioritizes making organic, nutrient-dense meals for my family, I rely on what I call slow food shortcuts. 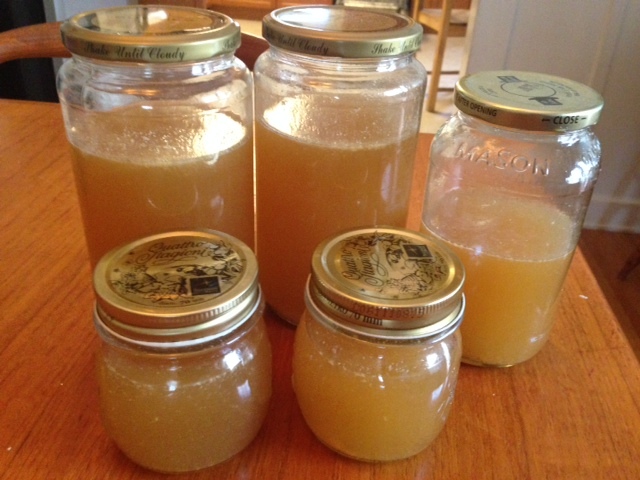 Once every two weeks, I make a massive batch of grassfed beef bone broth and another batch of chicken bone broth in a slow-cooker, and freeze them in small glass jars so we always have some on hand. I sneak it into all kinds of dishes, not just soup – it’s my #1 Immunity Secret during cold season. It’s also super tasty! This post is in two parts: right now, my turkey bone broth is done. The beans are cooking in the slow-cooker. The veggies are prepped. I’ve written the recipe. 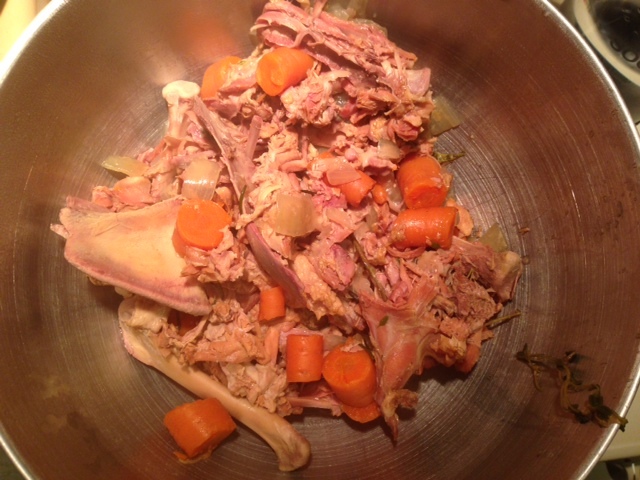 Part One, which I share with you here, is how to make a turkey bone broth in a slow-cooker. Part Two, which I’ll share on Sunday, will include the Turkey, Bean & Vegetable Soup whose base is this turkey bone broth. 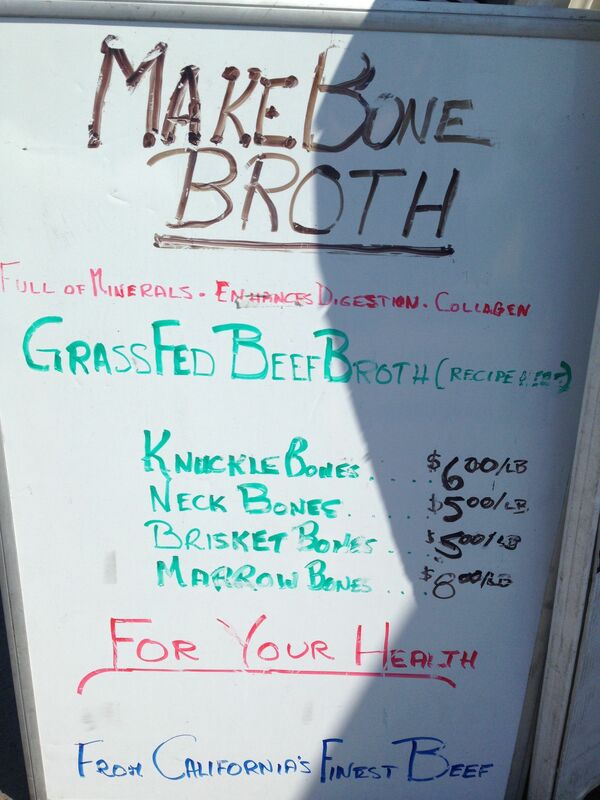 I’m excited to capture the responses from my family tomorrow night…For now, get started on the bone broth! Makes about 5 Quarts of broth (enough for several batches of soup, plus more broth to freeze for later). Active Time: 10 minutes to prep, additional 10 minutes over a 24 hour period to check on it, remove from heat, transfer to refrigerator. Total Cooking Time for broth: 24 hours, plus another 8 hours overnight to cool in fridge. If you’re using a slow-cooker, it’s best to start this recipe at night. 1) Toss the turkey carcass into the slow-cooker. 2) Add enough water to completely cover the bones. 3) Add chopped vegetables, thyme, bay leaf and apple cider vinegar. Stir a few times with a wooden spoon, making sure all the bones and veggies are submerged in water. Add more water if necessary. 4) Turn the slow-cooker to HIGH for 12 hours. 5) After 12 hours on high, lift the lid and add about 3 cups of water. (Some water will have evaporated in cooking.) Stir. Cover again. 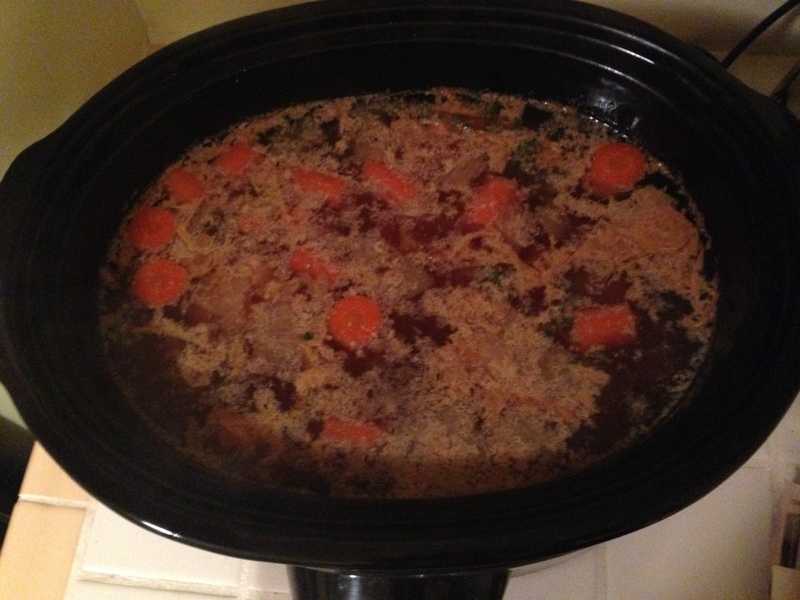 6) Re-set the slow-cooker and cook another 12 hours on HIGH. I checked the broth a couple of times within this 12 hour period, giving it a gentle stir with a wooden spoon, and adding another 1 cup of water. 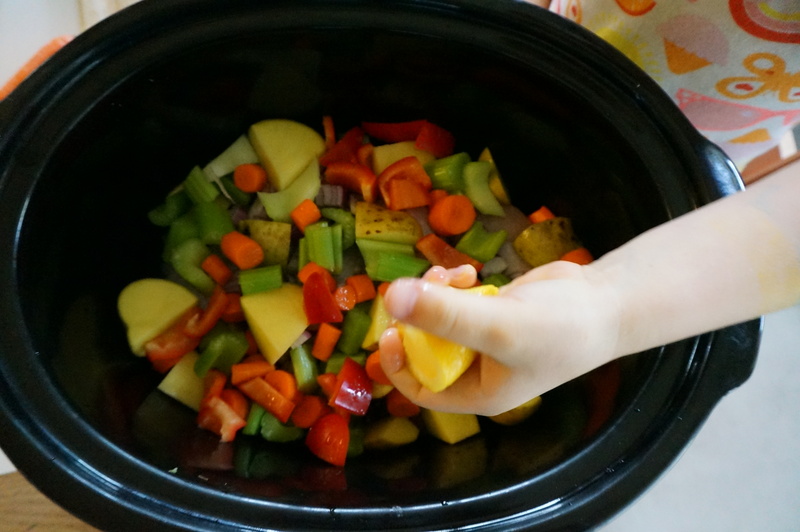 7) After the broth has cooked 24 hours, remove the slow-cooker from heat, and place on a counter, out of reach of small hands. Let it cool enough to handle (1 hour or so). 8) Strain out the veggies, bay leaf, thyme stalks and all the bones. Toss this heap of stuff into the trash. 9) Pour the broth into a stock pot with a mesh strainer placed inside it. (Not an affiliate link.) Skim off any remaining bits of detritus from the broth using a slotted spoon. 10) Place the pot of broth on the bottom shelf of the fridge, and cool overnight. 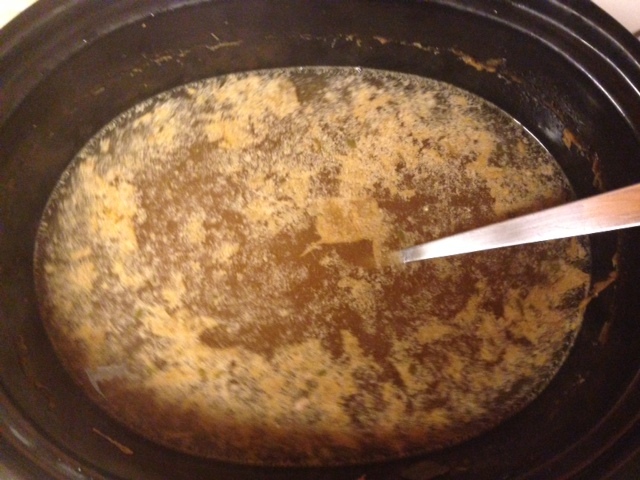 11) The next morning, you should see a layer of gelatin on top of the broth. (Homemade gelatin is a superfood, containing proline and glycine, used for centuries to improve digestive health, immunity, and strong bones. Don’t throw it away! Reserve it in a glass container in the fridge for later use. More on that here.) 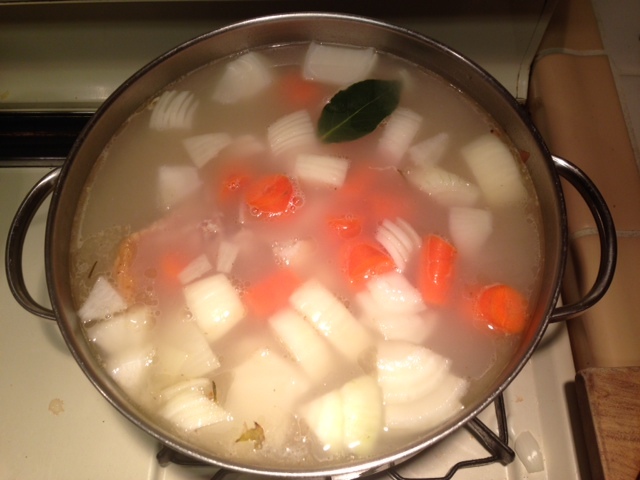 You do need to separate the layer of gelatin from the broth in order to make a tasty soup. 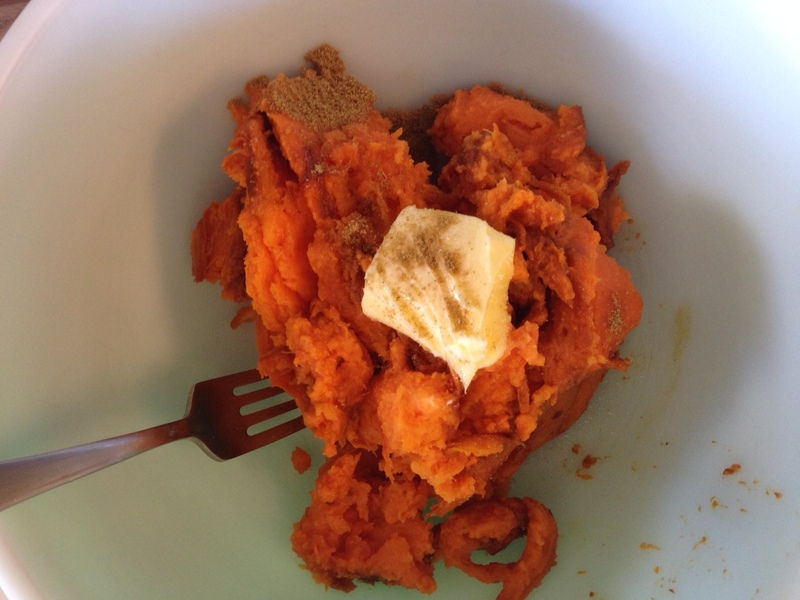 What meals do you like to make using Thanksgiving leftovers? Written by Abigail Morgan, L.Ac., Photos by Abigail Morgan, L.Ac, All Rights Reserved. Today’s guest post was written by our Associate Acupuncturist Jacqueline Gabardy, L.Ac. 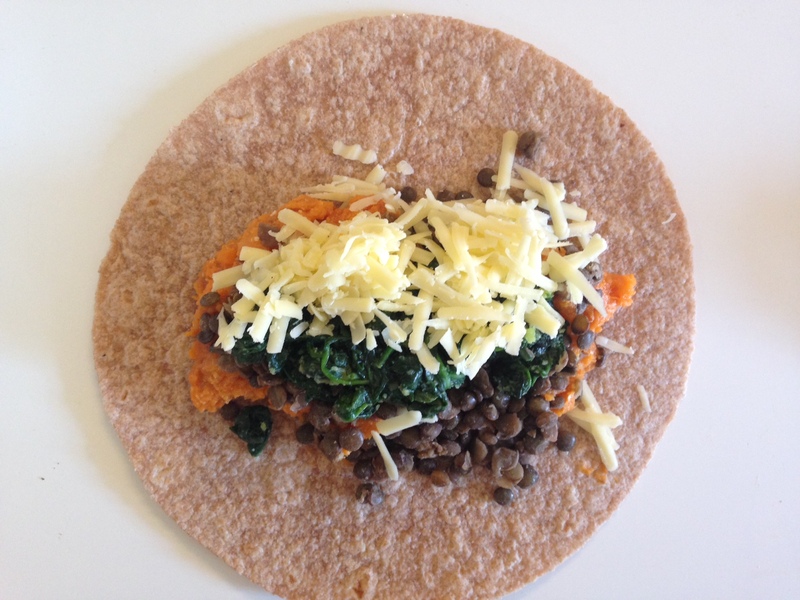 who blogs about health, nutrition and recipes at Sweet Beet & Green Bean. Whether you don’t drink at all or you are just trying to cut back, mocktails are an alcohol-free, refreshing way to enjoy a drink with friends on a warm summer day. These incorporate ingredients like aloe juice, raw apple cider vinegar, and coconut water, which all have important health benefits. 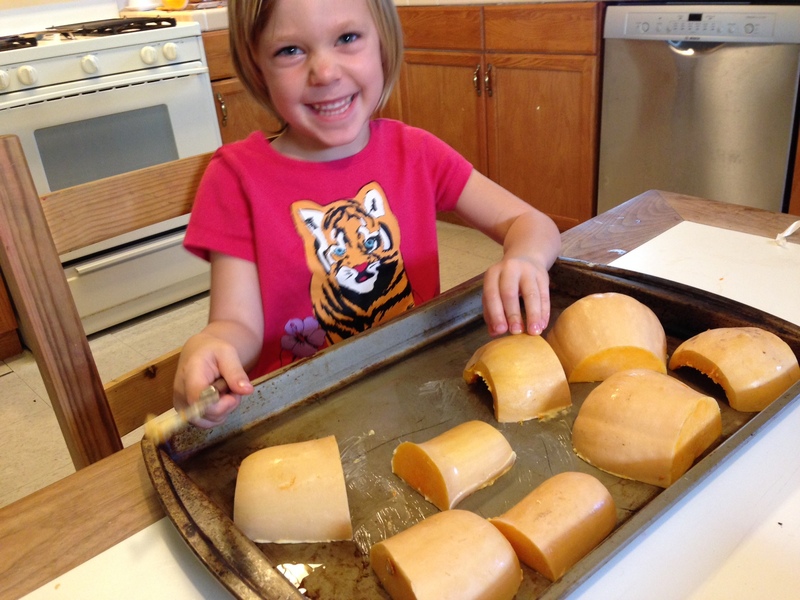 They’re super easy to make, too! Are you a tired pregnant or nursing mom? Trying to conceive? Suffering from digestive problems or chronic pain? Alcoholic drinks may be off limits for you, but these mocktails can actually help you feel bright and shiny without any side effects. A take on the classic mojito, the aloe-jito uses aloe juice in place of rum. Aloe Vera juice is a healing and soothing tonic in small amounts. It can detoxify, moisten and cool the body, clear skin, and soothe the digestive tract. Drinking aloe can relieve constipation because it has a mild laxative effect, so don’t overdo it on the dosage. 1-2 ounces per day is a enough for most people; you may want to start with a smaller dose if you are prone to loose stools. To make this mocktail, use a tall glass and add the lime (cut into smaller pieces) and mint leaves into the bottom and muddle them well. If you don’t have a muddler, you can use the handle of a wooden spoon. Once muddled well, add the sugar and mix well. I have used raw honey for this before, but it doesn’t mix in quite that well; I find maple or agave syrup work better. 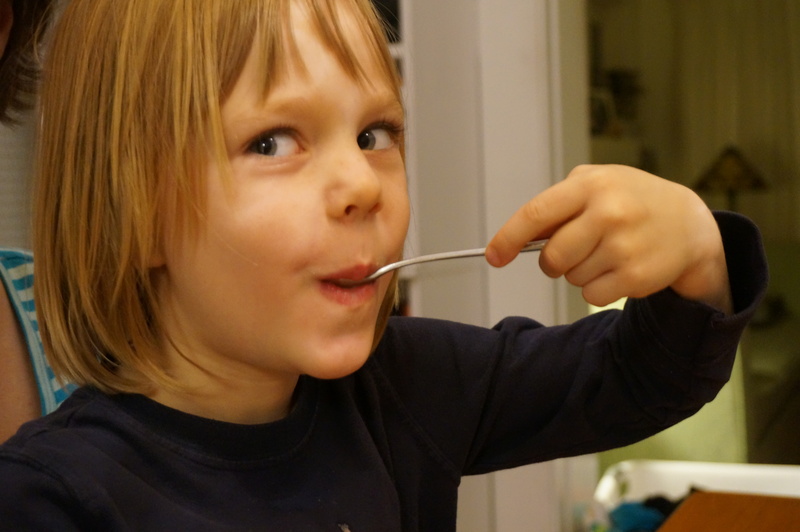 How much sugar you use will depend on your taste, I found 1 tablespoon to be plenty. Then add a few ice cubes and pour over the aloe juice, top with sparkling water and garnish with a lime wedge and another sprig of mint. 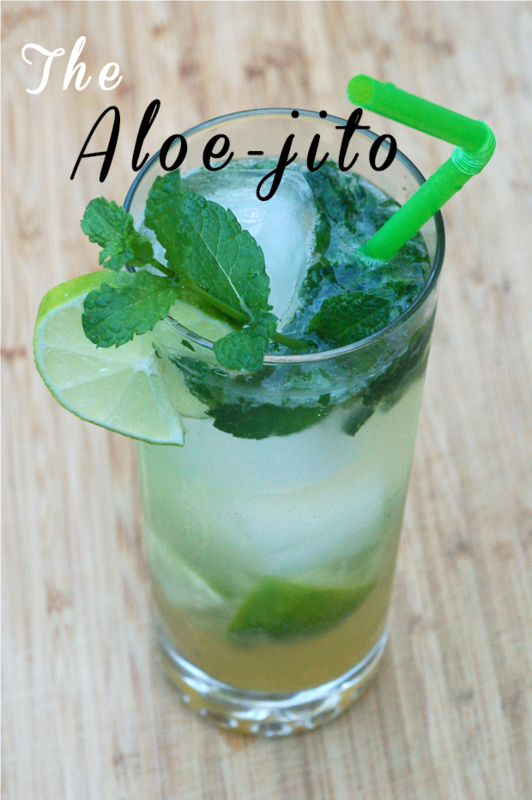 You can also make this recipe without the aloe and it is still quite refreshing. Shrub is a traditional vinegar-based syrup that is often used to make soda. In Chinese Medicine, small amounts of sour foods like vinegar are beneficial to the Liver system. Especially healthy are the naturally fermented vinegars like raw apple cider vinegar which contains probiotics that support digestive health. When added into the diet in small amounts, apple cider vinegar can support digestive and immune health. By making shrub with apple cider vinegar it becomes much more palatable because of the hint of fruit flavor and sweetness. Also, by mixing up a big batch of shrub it makes it much easier to incorporate into your daily diet or to serve to a big group of people. The fruit for the shrub should be finely chopped up first and added in after the vinegar and sugars are mixed well; I find a mason jar is best for this. Once mixed together, the shrub needs to sit in the fridge for at least 1 day but up to 1 week, the fruit flavor will intensify the longer it sits. After a week, strain the mixture to remove the fruit. You can use the fruit in a smoothie if you don’t want to waste it, but it’s a little sour to eat on its own and you can’t leave it in the shrub indefinitely. I used local raw honey as the sugar in this recipe, and the apple cider vinegar dissolves it well, but granulated cane sugar, maple syrup or agave syrup would all work. You can also try different variations of fruits and vinegars to see what you like the best! 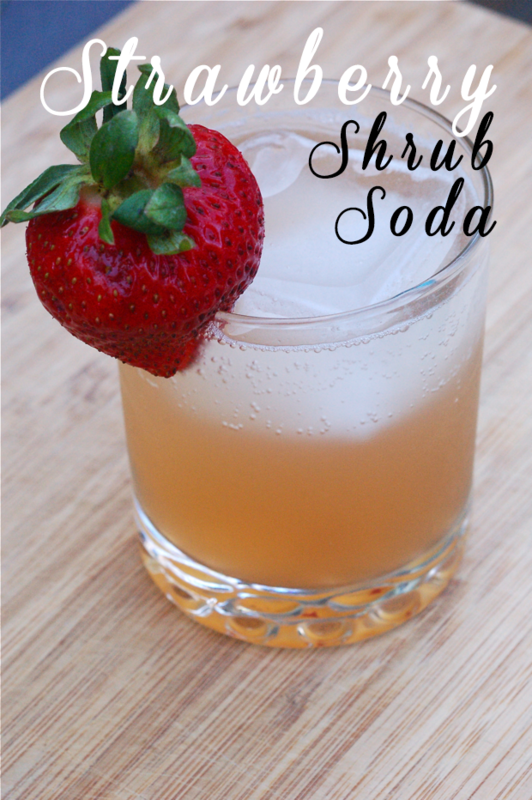 I like to serve the shrub soda over a large ice cube and I find about 2-3 tablespoons of shrub per cup of sparkling water is the right balance. Obviously you can play around with it and find what ratio works best for you. While we usually don’t recommend too many cold foods to our patients, an icy beverage is sometimes the only thing that feels refreshing when the weather gets really hot. 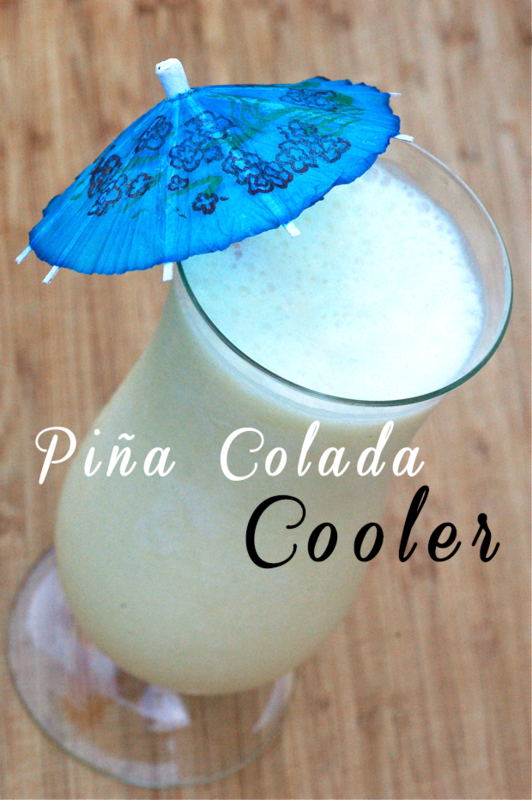 This recipe is more or less a traditional Piña Colada without the rum. Most traditional colada recipes just use coconut cream, which is a great source of healthy saturated fats and has anti-fungal properties, plus it serves as a delicious creamy alternative for those who are dairy sensitive. I’ve also included some coconut water in this recipe because it’s so high in electrolytes that it works well to keep us hydrated during those hot summer days. In addition to the usually pineapple and coconut ingredients, I’ve added in half a banana for a little extra sweetness and creaminess. Preparation of this drink is as simple as blending all the ingredients together, and topping with a tropical drink umbrella if you have one on hand! You can add a few ice cubes to the mix if you want it to be thicker and colder, but I didn’t find it needed them. Try these and let us know what you think in the comments section! In Chinese Medicine, Autumn correlates with the Lung system, which includes our lung organs, the entire respiratory tract, as well as our skin. This is part of why so many people experience common colds or skin dryness this time of year. By incorporating foods that support the lung system into our diets, we can keep our bodies healthy in a natural way. The color of the Lung system is white and the flavor is acrid, so you may notice many of these foods have both qualities, such as horseradish or garlic. 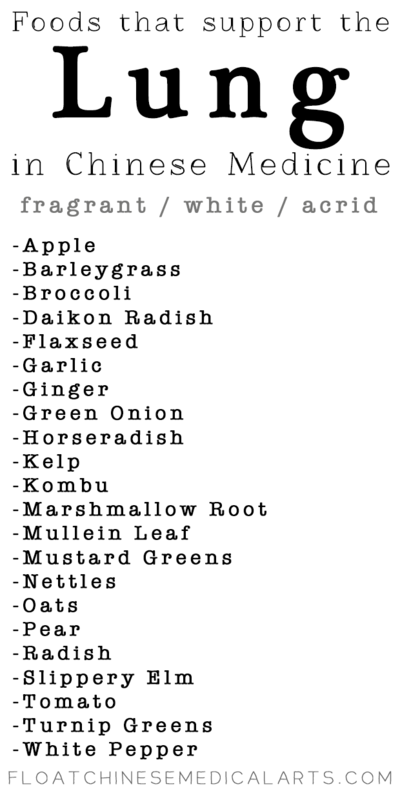 Other foods on this list, though they may not be both white and acrid, still support the Lung system in other ways. Pear, for example, is sweet but also particularly moistening for the lungs and can help cure a dry cough. If you are experiencing common colds or skin problems every year at this time, consider added some more foods in your diet to boost your Lung Qi! Four of the five main organs in Chinese Medicine have a season they correlate with, but the Spleen is unique in that it doesn’t have a designated season. Some say that late summer (also known as Indian summer) is the season of the Spleen. Others have said the Spleen’s energy dominates the end of each season. Regardless of what time of year it is, these foods that support the Spleen can usually help improve digestion as the Spleen is the center of the digestive system in Chinese Medicine. More detailed nutritional suggestions are made based on a patient’s specific diagnosis, but if you’ve been having digestion problems you might want to start by incorporating small amounts of these foods into your diet. Many of them have a yellow color, which is the color associated with the Spleen, and most of them are slightly sweet in nature because that is the flavor of the Spleen. We have already covered the Foods for the Liver, so the next organ system is the Heart. In Traditional Oriental Medicine, Summertime is associated with the Heart and Small Intestine. 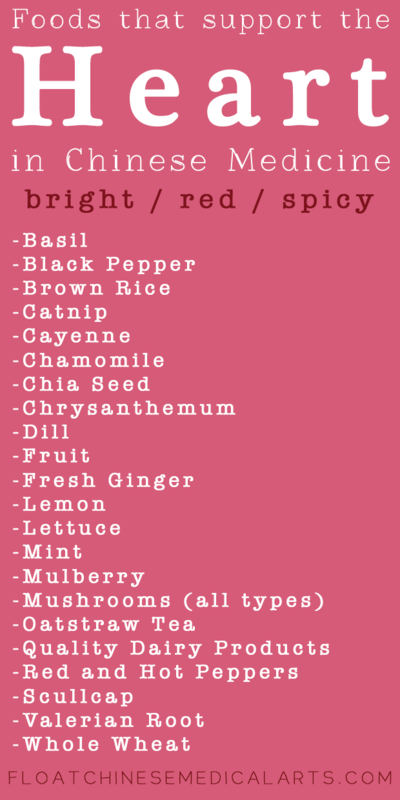 The color of the Heart system is red and the flavor is spicy, so small amounts of foods with these characteristics are often used to treat disharmonies of the Heart system, such as anxiety, insomnia, irritability, cardiovascular problems and hypertension. Fresh, cooling foods in season right now, such as lettuce and basil, are also very beneficial for cooling the body in the hottest months. It’s important to have a clear understanding of your Chinese diagnosis before making any major dietary changes. Many licensed acupuncturists use nutritional consultation as part of their plan of care.